Hey all! I'm slightly behind in round-ups, so like I did last week with my Bernie Dexter round-up I'm posting on Saturday when I usually do Special Pieces Saturday. 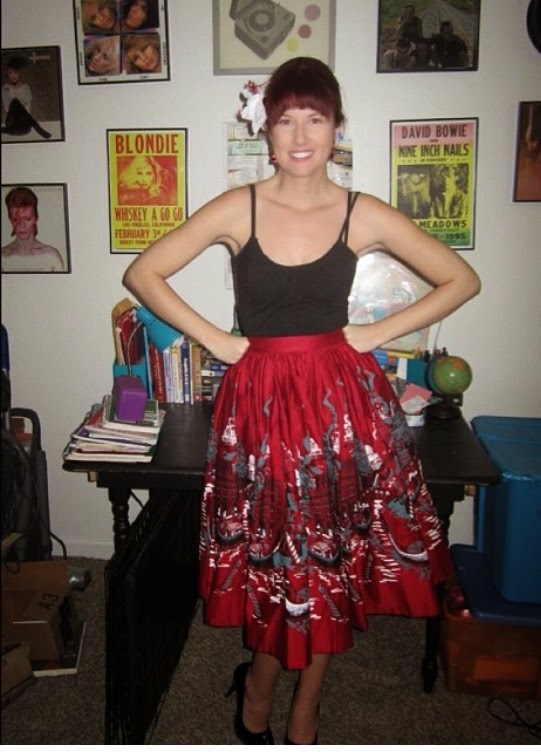 Pinup Girl Clothing skirts are great to wear in the winter because they're slightly thicker and heavier so they're slightly warmer. 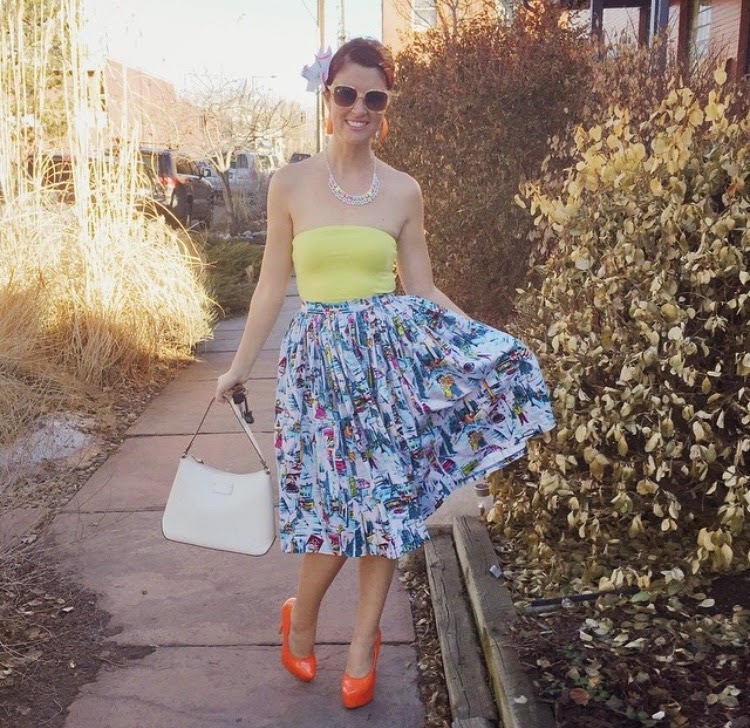 I definitely had a lot of fun keeping my style during the winter months while wearing PUG skirts! 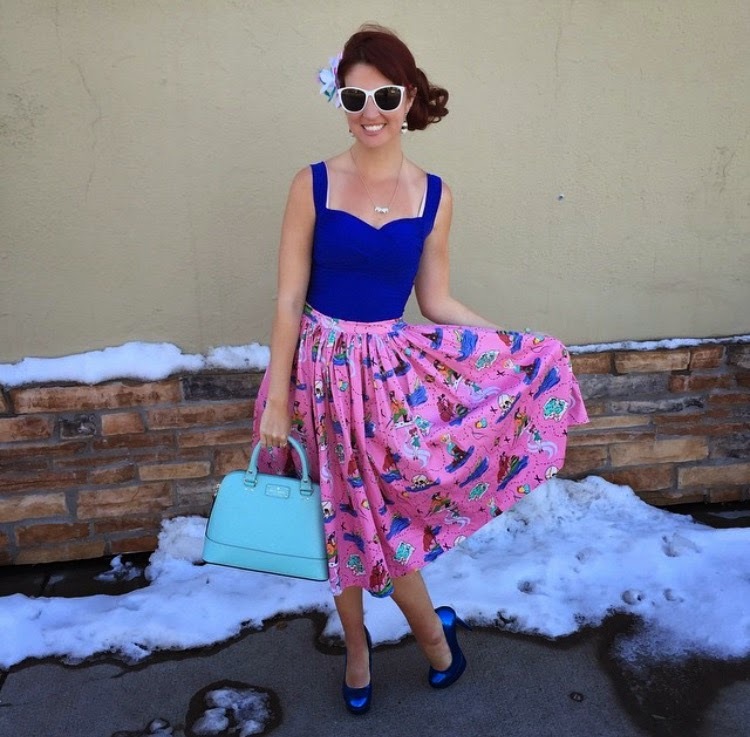 Without further ado, here are the Pinup Girl Clothing outfits from this past winter! 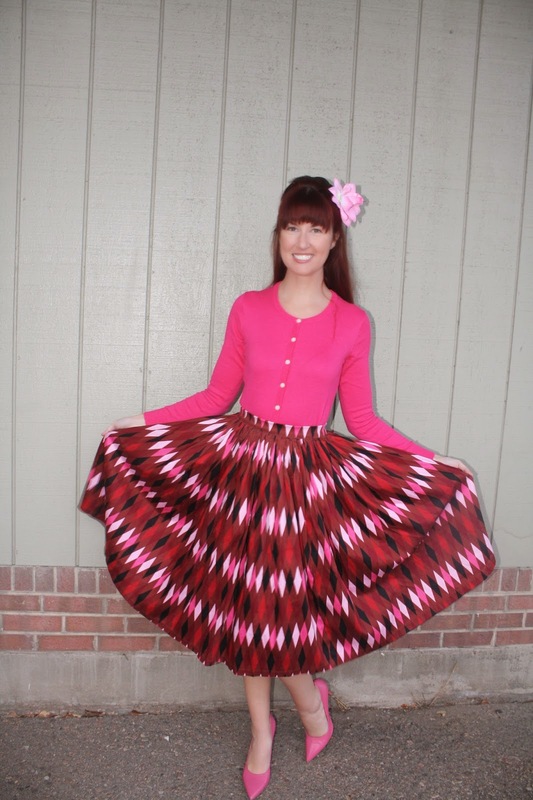 I do love this chocolate and red harlequin skirt! I got it over Black Friday and am super happy I have it. This was taken on a cold day when it was about to flurry. I've been pairing more and more cardigans with tea length skirts to help keep my style, stay warm, and still have bare legs (if I don't have to wear tights...I really won't). I think this outfit looked better in person than it photographed. All of the blues played off of each other really well and it's one of my favorite outfits that I did this winter. I love this pink castle skirt because the way the blue details play off of it is ah-maaaaa-zing in person. This was taken on a girls night out with one of my best friends when it was chilly but not freezing. 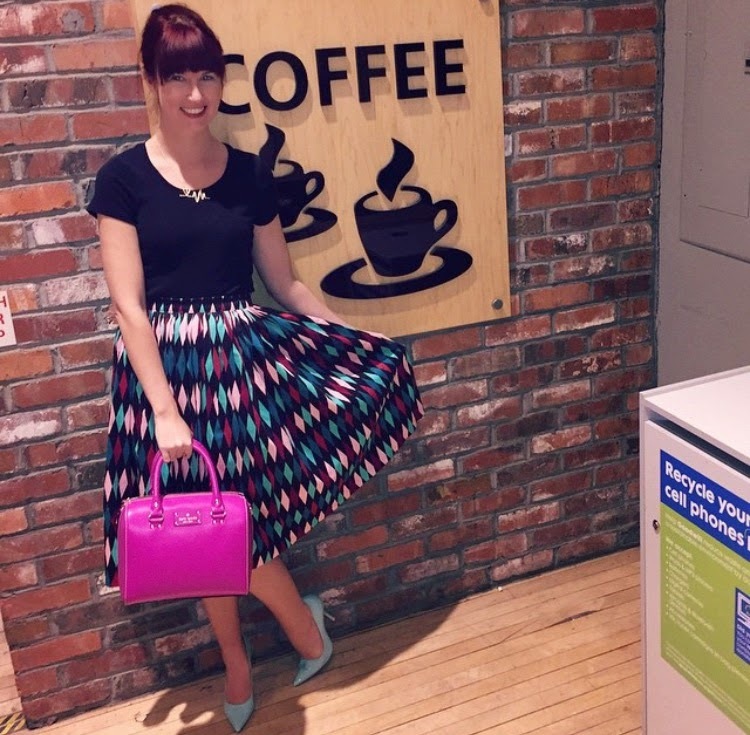 I wrote all about this amazing skirt here. This skirt is literally just too fun!! This was taken during #jennyjanuary. 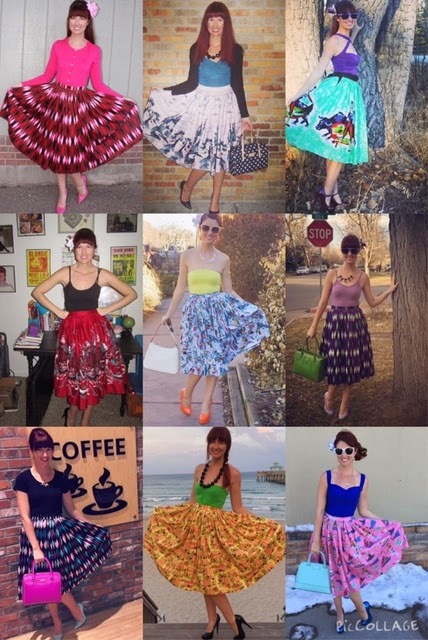 I forget why, but I was super MIA on the Internet and Instagram during #jennyjanuary-something due to a crazy schedule or something-which was a pity because I own sooooo many Jenny skirts! I have wanted this skirt for a year and am super glad that I'm finally a proud owner of it since this winter. 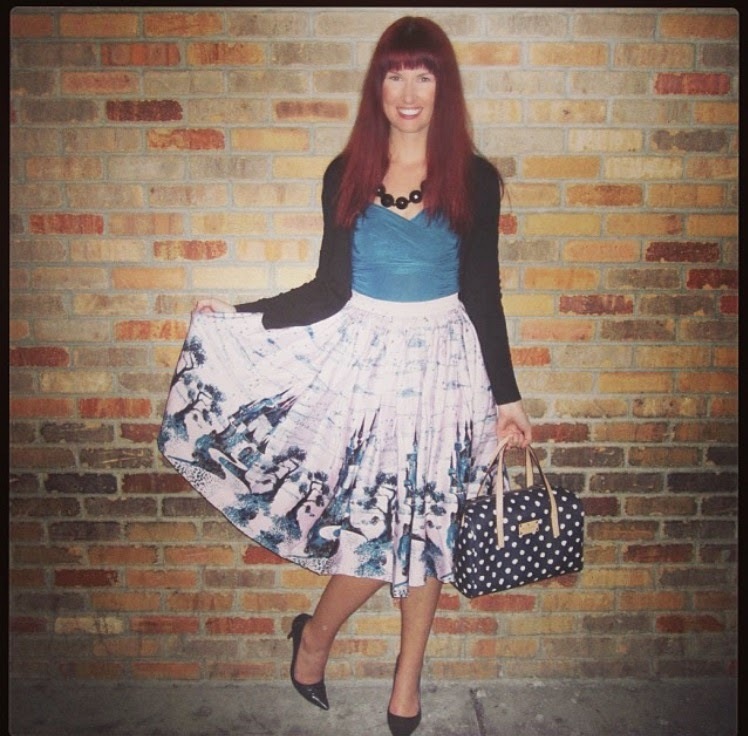 This Paris print is one of my favorite items from Pinup Girl Clothing. I wore this on an afternoon outing with one of my favorite people. This afternoon brought 60 degree weather and we had an amazing time hanging out on one of Denver's great patio restaurants. Full disclosure: this was a rare event in that I only wore these shoes for the photo-op!! My feet were super beat up after a long week in heels and being forced to run around in them so I wanted to walk around this afternoon in flip flops. It happen sometimes! This was my Valentine's Day outfit! PUG was also hosting a contest about wearing your favorite PUG pieces, so it was perfect. Green and purple are my favorite colors and favorite combination of colors so it was a perfect day to wear what I love! This was taken on a balmy night in February when some of my gal pals and I went wedding dress shopping...at the Good Will (...as you do). It was a perfect outfit for evening shopping and dining on a luke warm night! My only complaint about Jenny skirts: they are thicker, which is good, but packing them takes up a lot of room!! On my recent trip to Florida I originally thought I'd bring this one, a harlequin one, and possibly another one but trying to fit more than one in the suitcase (along with other brands) made the decision for me to just bring one. I landed on the Tiki print one as that's more of a beach-y theme and I had a lot of fun styling it with one of my favorites-if not most used-necklaces to dress it up a bit. Luckily I wore this on a night when we left for dinner when it was still light out and passed the beach in route so this photo could happen! I wore this to brunch on one of my first days back from Florida. Clearly it had just snowed within the week before, but don't let that fool you as it was a beautiful day out on this particular day! I love the Jenny skirt in Neverland because it has so many colors in it. It's easy to pair all kinds of different color schemes to it, including colors that match perfectly, as well as slightly more bolded color versions of what's in the skirt. I did the latter with this outfit in that there's a lot of blue in the skirt but not quite as bright as the Le Bomb Shop top or my blue G by Guess shoes. Great collection! My fav outfit is the very first one. Love all the pink! I have that skirt, too. :) I have two Jenny skirts. They pair so perfectly with Le Bomb Shop tops. They do take up a lot of room when packing! Thank-you! And yes, Jenny skirts + Le Bomb Shop tops are a marriage made in heaven!! Thanks, doll! I'm addicted to Jenny skirts haha!